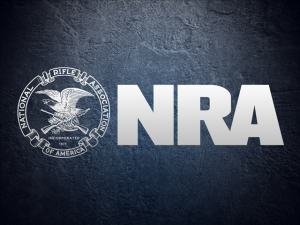 ALEXANDRIA, Va. (AP) — Protesters are targeting the northern Virginia home of the National Rifle Association’s top lobbyist and say the protests will continue. In one case, court records show Patricia Hill of Lincoln, Nebraska, has been charged with misdemeanor destruction of property outside the home of NRA lobbyist Chris Cox. Alexandria Police spokeswoman Crystal Nosal said Friday there were two separate incidents stretching back to last fall. A court hearing has been scheduled for May 21. Protesters also conducted a confrontational but peaceful protest April 10 outside Cox’s home as well as his wife’s nearby decorating business. Libby Locke, a lawyer for the Cox family, said the vandalism included spraying fake blood and defacing the home with stickers. “The Cox family does not view these activities as a peaceable protest exercise,” Locke said in a statement. “These coordinated tactics have crossed the line of civility and human decency.” Nosal said a city ordinance is in place regulating protests outside private homes, but said the commonwealth’s attorney is reviewing the law’s constitutionality. Catherine Koebel of Roanoke, Virginia, and Amanda Gailey, a professor with the University of Nebraska-Lincoln, representing the Great Gun Melt, stood outside Cox’s home with a sign reading “Chris Cox profits off dead kids.” They handed out fliers urging a consumer protest of his wife’s business. Koebel said the police were called out twice to the protest but told Gailey and Koebel they weren’t doing anything illegal. Koebel said Courtney Cox, Chris Cox’s wife, grabbed a cellphone from her hand and threw it to the ground, injuring Koebel’s hand in the process. She said she is considering pressing charges through a magistrate. Koebel acknowledged that the protests are confrontational, but said the tactic is warranted under the circumstances. “He’s profiting off murders and suicides,” Koebel said of Cox. She accused the NRA of encouraging its supporters to use armed intimidation as a political tactic. Locke said the sign saying Cox profits from dead children is “false, grotesque and clearly designed to target and intimidate the Cox family at their private residence.” Koebel said she expects the protests at the Cox home to continue.